It’s been quite a while since I’ve actually blogged about a place in the Kalamazoo area. I’ve been on a drought recently trying to find new places. It’s not that there aren’t still some places I haven’t been to. There definitely are. They just don’t always fit within my schedule or it’s not convenient to take a two year old. This past weekend, J and I were sitting on the couch watching Daniel Tiger’s Neighborhood with L when J asked if I wanted to grab something for lunch before I went to work. We sat there for twenty minutes shooting down each others ideas before we finally gave up. I went to work while J and L went to take a nap. I still needed something to eat though. I was really hungry. My travels were taking me to the north side of Kalamazoo before heading to Grand Rapids and as I was driving down Park Street towards US-131, I got an idea. 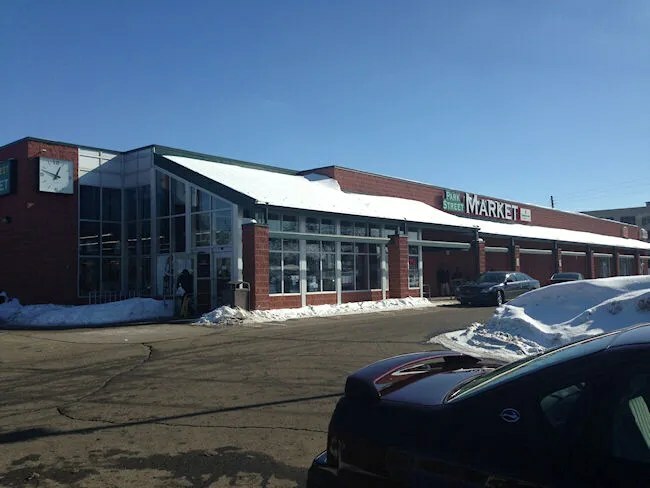 Several months ago, I read an article in the Kalamazoo Gazette about the Deli at the Park Street Market. I knew they had tasty ribs after sampling them at RibFest last year, but I was unaware just how great of food they had. 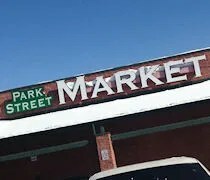 The thing that makes the North Park Market deli so unique is that they have real soul food. This was before my time in Kalamazoo, but there apparently used to be a pretty popular soul food place called Dips Restaurant and the masterminds behind that restaurant that have brought a lot of their recipes to the deli. There was a short line at the deli in the very crowded grocery store late on Saturday afternoon. The menu is printed on a piece of paper that is taped to the glass counter that shows off the delicious food for sale that day. I was leaning towards the ribs, but I’ve already had those and they’re a little messy to eat at work. 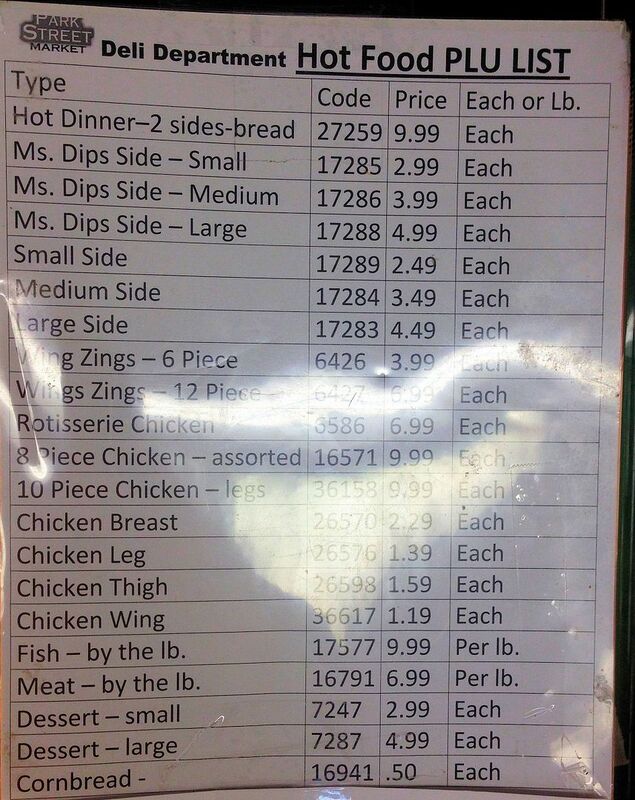 I chose the 12 Piece Wing Zings instead as well as a medium side of the macaroni & cheese. My order was boxed up and stuck with deli price tags before being handed to me to take to a cash register. On my way, I picked up a bottle of Pepsi to round out my lunch. The Park Street Market was PACKED that day and all of the check out lines were open, but had a helluva back up. I noticed the customer service counter had a pretty short line, so I headed over there. A short line was still a ten minute wait, but it would have been much longer in one of the regular check outs. My total was a little over $12 which I was able to pay for with my credit card. I finally made my way out of the store to start my drive to Grand Rapids. 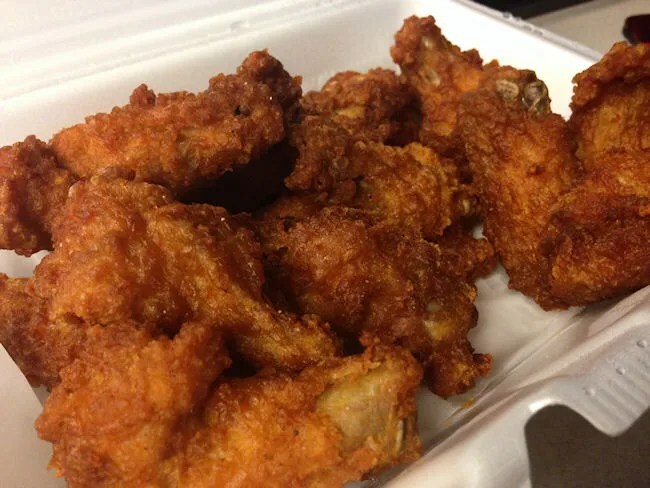 As soon as I got to work, I popped open the Styrofoam container with the Wing Zings. The small wing pieces are breaded and fried crispy golden brown. The breading has some kind of heat built in to it which gave the wings a little bit of a spicy kick. The wings were a little on the small side, but they were very juicy and super tender while still keeping that really crispy breading. Once I finished off all twelve wings, the macaroni and cheese was up next. The deli really makes a point to make sure you know these are Ms. Dips sides. 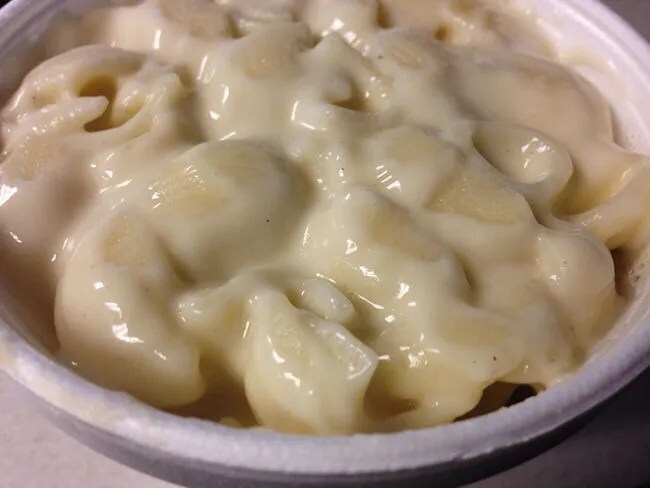 The macaroni and cheese were large, tender noodles in a very rich, creamy cheese sauce. I couldn’t tell you exactly what kind(s?) of cheese are used, but it’s not your typical bright yellow cheddar cheese mac ‘n cheese. It’s much more complex..much creamier…and very rich. 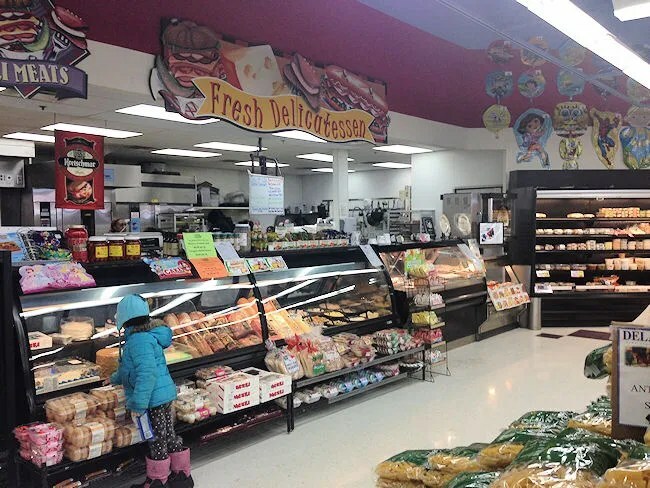 The Park Street Market Deli is not the typical supermarket deli. You can usually get a pretty decent meal with made in bulk sides at a typical market. At Park Street, you’re going to get something more along the lines of a smaller batch home made side as well as some of the best ribs and chicken in Kalamazoo.